It’s that time of year again for beautiful colors, blossoms, cool breezes, and sunny afternoons at the park. Yes, Spring is finally approaching. But before Spring gets underway it’s important to assess your landscape for the season to ensure your lawn is healthy and handsome. We here at T&B Lawncare have some expert steps you can take now to assess your spring landscape. A harsh winter can cause significant damage to your lawn. If your yard did experience damage during the winter, you may see signs of that as the warmer months approach. Not to worry. The great thing about a lawn, is that it can be revived with the proper treatment. Be on the lookout for scorched foliage, broken or hanging branches, crushed shrubs, uprooted plants, overgrown plants, cracks in landscaping and stripped bark. Also take note of any signs of damage from snow removal activities such as sand build up, salt damage, plow damage, etc. Take notes of all these observations with pen and paper and make plans to address these damages before you start planting or treating your lawn. If you see any broken tree limbs or hanging branches, call an arborist or your local Andover landscaping professional to assess the situation and take the necessary steps to correct and prevent further damage. We don’t recommend trying to cut down tree limbs yourself. Tree branches are more heavy than you would think and they can be very unpredictable when being cut down. Bare patches of grass is another common issue with harsh winters. If you spot any bare patches, consider applying grass seed and fertilizer. Rake dead leaves, remove weeds, water your lawn, and treat stressed areas with fertilizer where necessary. If you have a sprinkler system, it’s a good idea to ensure everything is working properly and to prepare it for spring. There are some important steps you should take now to prevent problems from occurring later on in the year. For example, before filling the pipes, check to make sure the soil is frost free for at least 12 inches below the surface. Filling your system too early can cause expensive freeze damage to your pipes. Be extra careful when filling pipes with water. If your pipes receive a sudden influx of water they can burst. To avoid this, you’ll need to utilize air pressure release valves when filling the system. Once you’ve filled the system with water, check each zone. Check for water leaks or broken sprinkler heads. Make sure the heads are spraying properly and are level with the ground. Check the timer program to see if it’s running correctly as well. Once you’ve surveyed the land and gotten an idea of what repairs need to be made, now you can focus on how your landscape is going to look this Spring. What colors do you want to see in your yard? What plants do you want to grow and showcase? What’s your overall vision? What landscaping features have you been dying to include in your yard? Now is the time to think these ideas through and come up with a game plan. Put together a budget of how much you’re willing to spend on your project. Pull out your notebook and make some drawings of how you would like your lawn to look. Check out some DIY projects to jog some of your own ideas. Can you do it yourself? Or, would you like to enlist some professional help? These are the questions you should answer now. After following these three expert steps to assess your spring landscape, you’ll be well on your way to having an award-winning lawn this Spring. 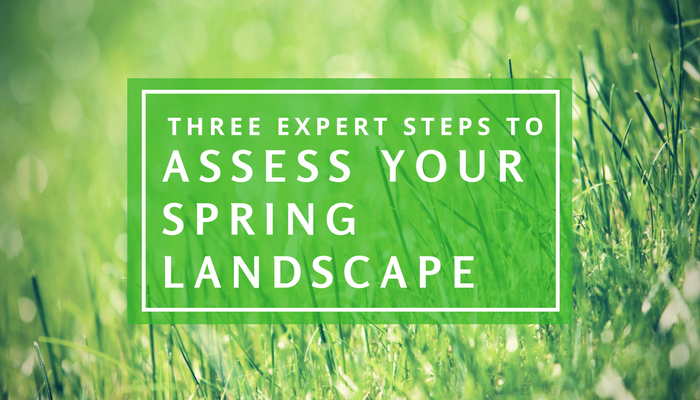 No Replies to "Three Expert Steps To Assess Your Spring Landscape"